"If God does not exist, then everything is permissible. If there is no God, then there are no rules to live by, no moral Law we must follow; we can do whatever we want." While the charade of Russia, China and America being at odds with each other continues over fabricated circumstances (only to create more chaos in order to implement more government control on a global scale), one must take note that these supposed arch enemies are all in agreement with the same communist ideologies. These communist nations (all three of them) are attempting to convince their people that God does not exist, that the rules you live by are what they approve or disapprove of and that there is no moral Law we must follow (Psalm 2:2). It's the idea that we can do whatever we want to as long as they agree with what we do. When you see what these communists produce, you can see why they do not want you taking heed to the God of Moses (Exodus 20) – because God's Law simply exposes them for who they are. Look at the fruit of these communists: murder, theft and destruction (John 10:10). They would be put out of business if the people across the world would simply obey God's Commandments. These tyrants understand that wars (the wars they create) are brought forth through the rule of force, and force is what they use to rule. While peace is found through the reign of Law, it is the Law that these tyrants refuse to submit to in order to have peace (Isaiah 51:4). In contrast, righteous King David understood that it was the Law that made the king, when he stated, "I am for peace but when I speak they are for war" (Psalm 141:5). In other words, King David knew that God's Law, when magnified, brought forth peace through judgment. "All the miseries and evils which men suffer from: vice, crime, ambition, injustice, oppression, slavery and war, proceed from their despising or neglecting the precepts contained in the Bible." And to bring it to the present, Franklin Graham comes to my aid when he says, "(The) president and his attorney general have turned their backs on God and His standards, and many in the Congress are following this administration's lead." "Bradlee Dean, you stinking sack of vomit, this is just the same old tired, idiotic BULLST!!!! You stupid b#@tard – how dare you accuse our legitimate government of 'tyranny'? You hypocritical prk! YOU are determined to impose Christian tyranny on this proudly secular, multi-religious country. YOU are like Hitler, Stalin and Mao, not Obama, who is a good, decent, honorable, honest, courageous, compassionate man – EVERYTHING YOU ARE NOT!!! "It's ILLEGAL to teach evolution in schools??? You blithering idiot!!!! SAYS WHO?????? You f*#king a@#hole! You are determined to teach kids the idiocy of creationism as scientific fact in schools!!!! How dare you demand that our schools indoctrinate kids with BULLS@#T? "You are determined to teach blatant lies about homosexuals and homosexuality to young people, which will turn them into the same vicious homophobic bigot YOU are!!! You are no better than Hitler. But Hitler was at least an intelligent and educated man. YOU are a blithering idiot with s@#t for brains. I am going to organize a campaign to have you permanently barred from ever setting foot in any public school in the U.S. for life, and will see to it that if you ever do so, you will be immediately arrested, prosecuted and given a stiff jail sentence . YOU ARE A F@#KING CRIMINAL. A bigoted, hateful, hypocritical and self-righteous a@#hole! "It's your funeral, you douche bag!!!!" But, I do say, that you would do well to answer a tyrant in his lawlessness by obeying God and keeping His commandments while you have the time to do just that. There will always be men like this in the world, yet it does not mean they will go without consequence! That is why we have Law! We live in a fallen world, and I say that by the grace of God, let's pick up this world and magnify the Law against these crimes! Tyrants need to be reminded by the Lord's children that God does exist, and that His children will not tolerate their crimes any longer! And this is how the kingdom of God is established on this earth as it is in Heaven (Matthew 6:10). 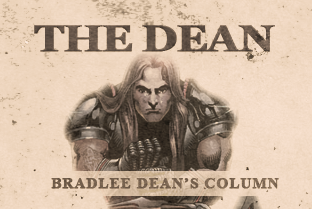 Listen to Bradlee Dean on The Sons of Liberty Radio Here.